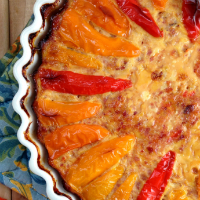 If you need a breakfast idea that looks and tastes legit but takes only 15 minutes (max) to prep before loading into the oven, this Sweet Pepper Quiche is it. I came up with this dead simple idea to use up some leftover ham and mini sweet peppers that were languishing in the refrigerator. Some of my best recipes are the product of constraints such as the need to re-purpose leftovers. 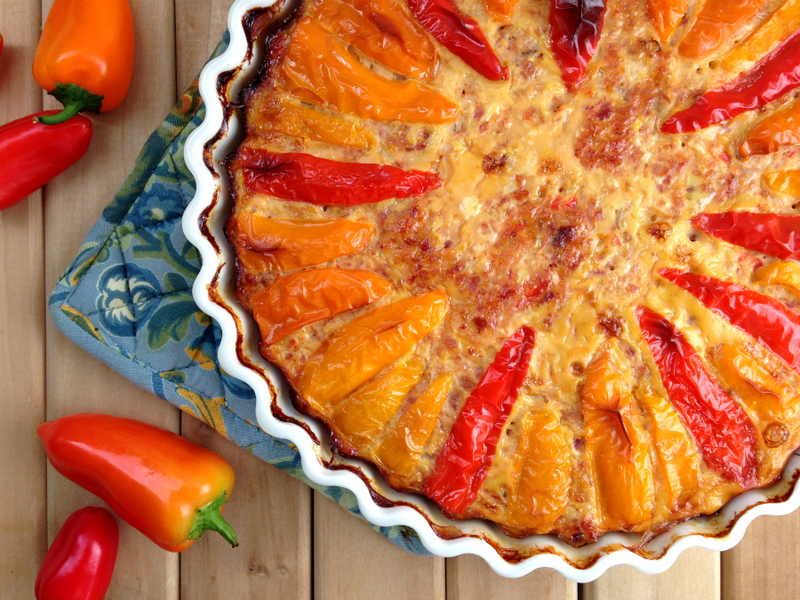 Dress your Sweet Pepper Quiche up by slicing some of the sweet bell pepper into strips and arranging in a circular pattern for rustic, sun-burst appeal. The beautiful pie plate here was a birthday gift from my mother this year, and it makes its debut here with a recipe that’s as simple and appealing as it is. Crafted by ceramic artist Edith Bourgault, it has a mysterious French name (“Pour la Tourtière d’Annette Stoneware Pie Plate”) and I am in love with it. Actually… the blue potholders in the photo were a gift from my mother as well! I suppose beautiful, blue-patterned kitchen accessories are a theme. 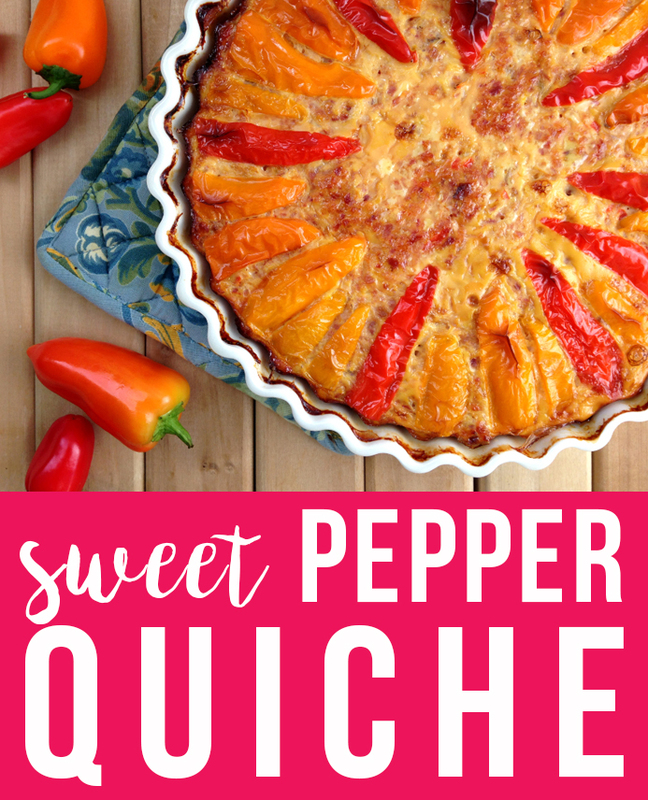 This simple Sweet Pepper Quiche recipe comes together in 15 minutes and is made of only 3 ingredients: sweet peppers, ham, and eggs. Preheat oven to 350F. Grease a pie-plate (I used one that was 9.5" in diameter) and set aside. Place the chopped peppers and ham into a food processor and whirl until grated very finely. Transfer to a medium mixing bowl and crack four eggs over the mixture, then work them in with a fork. Spoon into the greased pie plate, level with the back of a fork. Slice 3-4 little sweet peppers into strips and lightly press them into the egg mixture. Bake in the preheated oven for 1 hour or until browned. Cool for 5 minutes, then serve warm. I used baby sweet peppers for this, but full-sized bell peppers would work just as well. If you like spicy foods, shred half of a jalapeño into the mixture before spooning it into the pie plate. Could i use pre cooked bacon for this? Joanna, unfortunately I don’t think bacon would be a good choice due to its fat content (all the melty fat, even from pre-cooked bacon, would prevent the quiche from firming up). Thanks, Gail! Hope it turns out well. Does this really only use 4 eggs? Doesn’t seem like enough for 8 servings! Jeremy, it’s mostly ham and peppers (eggs are just the binding agent). The serving count is subjective… you might find that this recipe is better divided among four.